Today's blog post is a tutorial. I recently inherited a Lendrum spinning wheel, and while it's a wonderful wheel, I have found maintenance and usage documentation lacking. So, when one of the footman connectors broke recently, and I couldn't find any information about what to do, I decided to document how it went for me, and maybe it will help someone else. I was just spinning along, when I suddenly stopped because the right footman connector spontaneously broke in two places. You can see that it is not connected above or below the part that rocks back and forth. I don't know what it's called. If I had a manual or a diagram, I would know. But I don't. Next, I ordered the replacement parts and one tool. 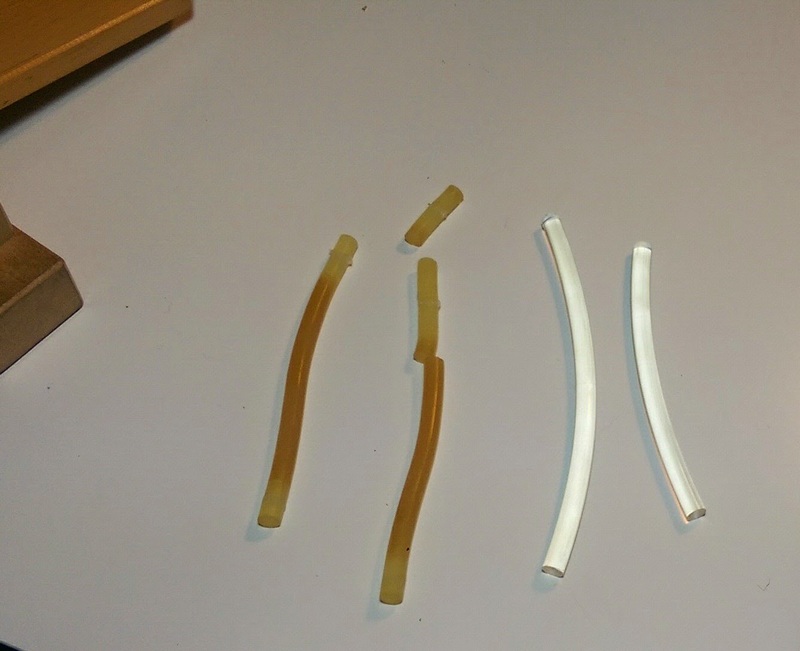 I purchased the pieces pre-cut, but I did find other places that offered one long piece that you can cut yourself. I also ordered the square screwdriver I needed for the Lendrum screws. Rumor has it that earlier wheels had Philips head screws, so take a look at your wheel before you buy the screwdriver. First step of the actual repair: I took out all of the screws, keeping track of where they go back. Once the screws were removed the footman connectors were a little tight in spots, but they pulled right out. Even though the left one didn't break, I replaced it anyway. Seemed like a good idea. Old connectors vs. new connectors. If your connectors look like the set on the left, you should buy a new set so you have it when one breaks. They do age. 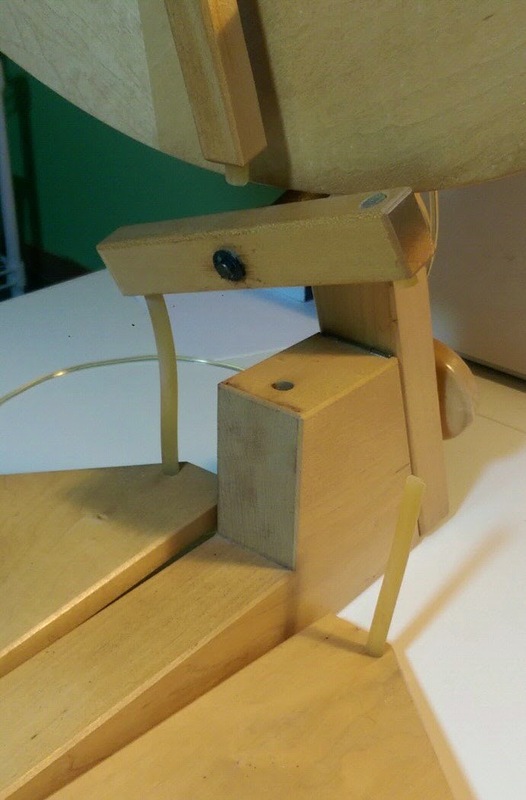 Second step: I re-installed the left connector, pushing it in as far as it would go into the rocker-thingie above, and flush with the bottom of the treadle below. 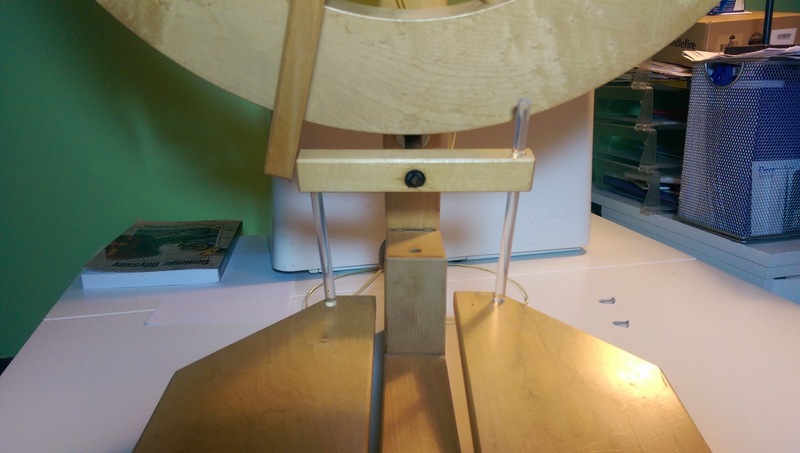 Re-installing the treadle screw was pretty straight-forward, but I really had to push on the screw in the rocker-thingie. The screw goes straight into the connector, with no threaded guide, so you have to push a bit while twisting to get it to go in. Can you see this? The connector is Right. There. and you gotta make the screw go through it. PUSH! CAREFULLY! Now, I had to guess on how to install the right connector. It connects with screws at the treadle, the rocker-thingie, and the footman. 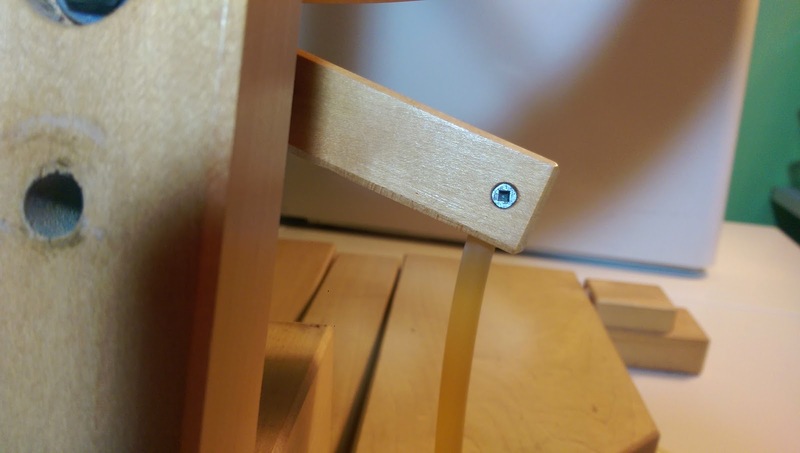 The question becomes where to secure the rocker-thingie. What I did was to line up the left and right treadles and adjust the rocker-thingie to be parallel to the floor, and secured it there with the screw. Shadow makes it look a little off, but I think it is straight. Last step! (One reminder: if you moved the drive band out of the way, or if it moved itself, be sure it's back where it needs to be before you secure the last screw, or else you'll have to remove the c clamp to put it back on.) At first I pushed the connector all the way into the footman, but then the footman was too close to the rocker-thingie to move as far as it needed, so I backed it out a bit and looked at a few other wheels on the internet to see how they looked. This looked about right, so I installed the last screw, and gave it a little whirl. I hope this is helpful to someone. If you have a schematic or diagram of the Lendrum Original, please share. At least tell me what the rocker-thingie is and I'll edit the post with the correct terminology. Just wanted to say THANK YOU for this. I just got a used lendrum from a friend and it is in great condition except for these pieces (they are old and yellow from age and disuse), and now I know exactly what to do! You are a lifesaver! 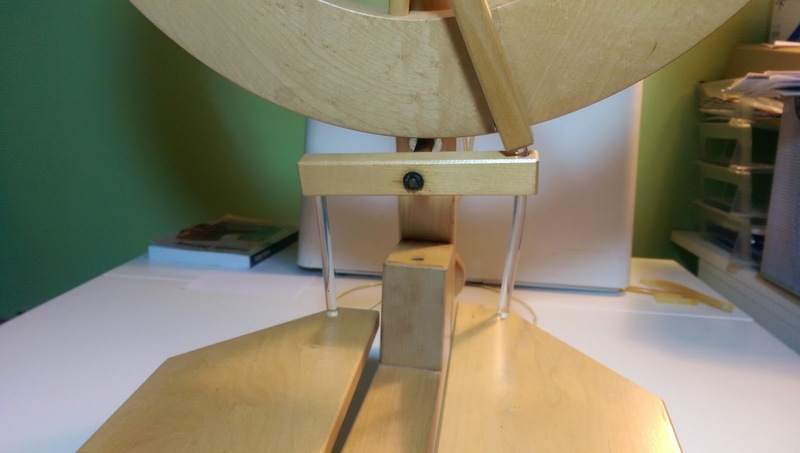 I just printed this out for my DH to replace the connectors that broke last night when I took my wheel out of its carry case to demonstrate spinning at our county fair. Thank you very much for having this available. You are a goddess! This was extremely helpful - thanks for posting it! 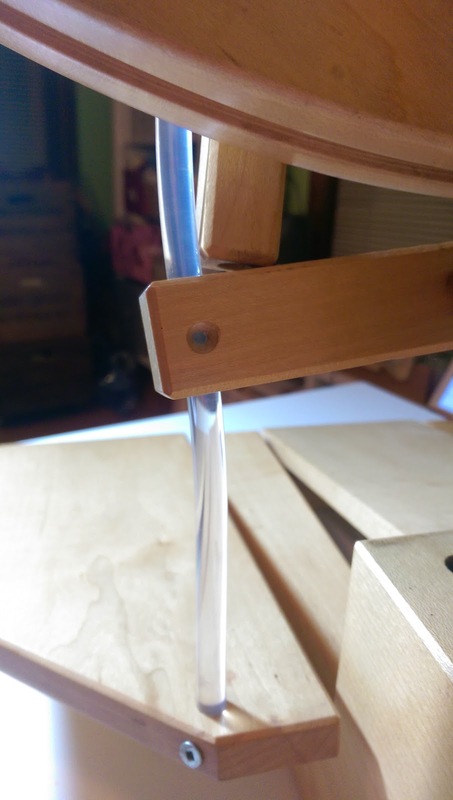 I just received the new connectors from the Woolery, and was dismayed to see that they don't have pre-drilled holes. 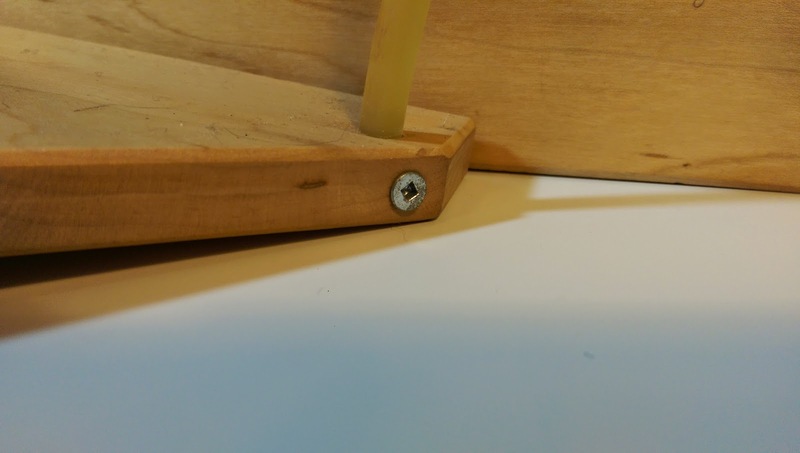 I bought the drill bit that works with these screws (cheaper than buying the whole screwdriver), and was able to install them quickly with the help of your guidance. Thanks! I think buying the connectors pre-cut is the best way. Considering how kinked my old ones were, I would never be sure I had the right length. Thank you for posting your tutorial on replacing the footman connectors on the DT Lendrum. 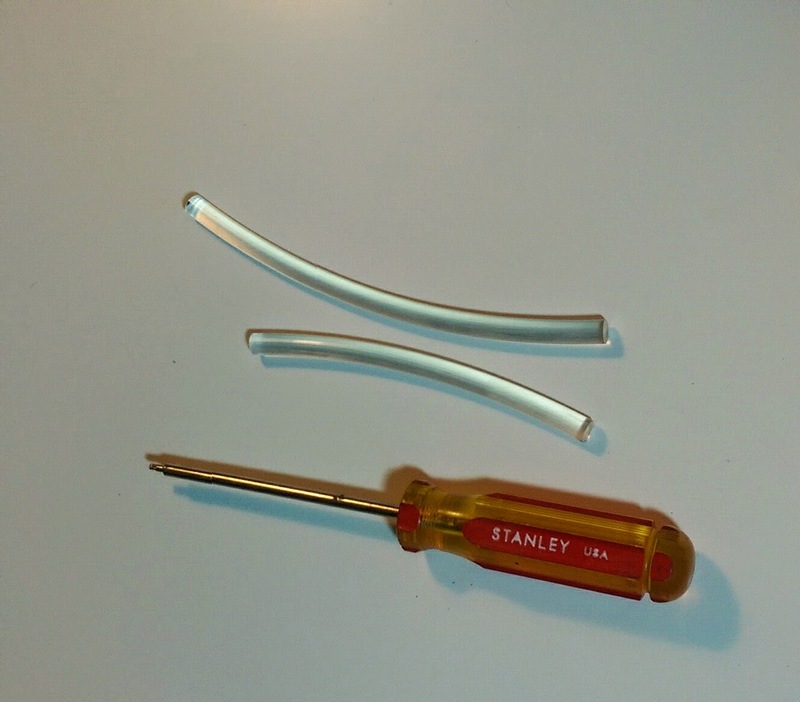 The most difficult part of the procedure was finding a screwdriver with a #1 square tip. Heaven knows why Lendrum changed from Phillips to square head screws. Anyhow, it's done and I can spin again!!! My "long" connector on my DT broke doing a demo. Luckily, we had 3 other spinners that day! Thank you so much for posting this wonderful tutorial about replacing the connectors on the Lendrum DT! Mine broke last fall and I purchased the plastic connectors and purchased the screwdriver as you recommended, and have been trying to work up the courage to try to fix it since then! Today was the day and I set out with tools and your post. All went perfectly and my wheel is all fixed and ready to go. Thanks again for this tremendous teaching post!!! Absolutely invaluable, thankyou so much. Thanks for this very clear tutorial. I just took out my Lendrum, which had been sitting in a corner of our living room for several years aging while my kids were babies. I'd noticed the drive bands were yellow with age, and wasn't too surprised when one did indeed snap when I started to show my now 4-yr-old son how the wheel works. He was still happily peddling along nice and slowly when the footman connector snapped too. That I worried I'd have to send the wheel off for. It's nice to know this is something I can repair myself.